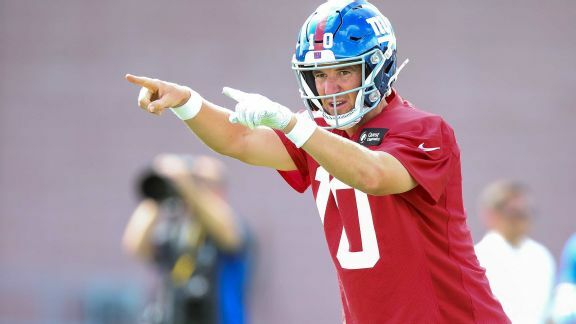 EAST RUTHERFORD, N.J. -- Eli Manning jogged onto the field for the first day of training camp practice with his trademark gallop. It was the same look the New York Giants have seen for the past 14 years. Shoulders slightly slumped, chin held high, short steps and an aw-shucks wobble supporting his stringy, 37-year-old frame. Manning doesn't have the chiseled body type sported by many of his teammates. He's not known for his work with heavy weights or his bench press. He also doesn't sport a gut or the love handles that plague most men his age. The two-time Super Bowl-winning quarterback doesn't even have any visible gray hair despite being on what former general manager Jerry Reese called the back nine of his career. Manning is listed at 220 pounds and sports a slender waist. Slimmer than you might expect. It was my first observation upon joining the Giants beat in 2013. Manning was fitter and slimmer than television projected. Not much has changed with his appearance in the five years since that surprising first impression. "He's the fittest 37-year-old that I've ever seen," new Giants coach Pat Shurmur said earlier this year. It's not simply genetics. Manning was in the Giants' building just days after the season ended, working in the gym alongside fellow quarterback Davis Webb. Most days in January, February, March and half of April, the only two quarterbacks on the Giants roster at that time were grinding side by side, making sure neither slacked. The football senior citizen went step for step with the 23-year-old NFL sophomore. Since his first career start in 2004, Eli Manning has been one of the most durable quarterbacks in NFL history. There was even a competition or two to see which player was reaping the bigger benefits from the workouts, including one contest that measured body fat. The two quarterbacks each had three weeks to get after it -- three weeks of quality nutrition and hard workouts to see how much their body weight and fat percentage would drop. Webb claims to have won by a smidgen despite the quality effort from a competitor 14 years his senior and, by the general laws of nature, past his physical prime. Manning called the result questionable, perhaps because Webb was cheating the system with his age. "He did a really good job, especially since it was a really short time," Webb said. "Usually you need a month. It was close, but I got him by an inch." It wasn't for a lack of effort. Manning is a creature of habit. His breakfast is almost always the same -- oatmeal, fruits (lots of them) and throw in some protein. Maybe it includes a smoothie and a water. Webb says it's part of the routine he's become so accustomed to seeing. Breakfasts with Manning in the Giants' cafeteria have become the norm since Webb was made a third-round pick last year out of California. "He does the same thing. He's so great with his routine," Webb said. "Same thing for breakfast every day. Same thing for lunch, if it's a similar type of menu. He's a freak when it comes to nutrition." In typical Eli fashion, he downplays the efforts. It's the same approach he takes after threading the needle on a pass in a Super Bowl. "It's about ... I'm not trying to gain a whole lot of weight, or lose weight. It's just maintaining. Feeling healthy," Manning said. "It's a lot of veggies, fruits and proteins for the most part. Carbs are involved to keep your energy up, but make sure you eat the right kinds. "I wouldn't say it's an exact diet. Just eat healthy, eat smart." Unless it's french fries -- Manning's self-admitted guilty pleasure. When he makes fries for his three young daughters, he always has to taste them. You know, just to make sure they are good. He wouldn't dare serve fries that didn't meet his lofty standards. In the weight room, Manning's routine stands out. It's hardly the same as his shredded teammates. In fact, every time you pass the Giants' weight room and Manning's there, he never seems to be working with any sort of weights. Forget about inflating those biceps or triceps. Instead, there is a much stronger concentration on his core. "That's accurate," Manning said with an accompanying smirk. "Obviously, for a quarterback it's more core, rotator cuffs and small, little muscles. But you still have to lift weights and get your legs involved. I do that, but that is probably, compared to everything else, not the No. 1 thing I'm doing." Even though he's often grinding, the weight work must happen when nobody is around. "I see him doing abs and some aerobic stuff," defensive end Olivier Vernon said with a smile. This is by design. Manning is three years older than any other Giants player. He needs to operate in a different manner than Webb or rookie Kyle Lauletta, who was an 8-year-old grade-schooler when Manning was drafted. "Getting older, it's obviously different," Manning said. "It's not as much strength or heavy-lifting stuff. It's staying flexible, staying in great condition. You're lifting weights and running to stay healthy." Webb insists that Manning is hardly a slouch. He does a lot of planks and welcomes the competitions with his younger teammates. Manning, not exactly known for his speed, runs hard and tries to keep up with Webb, who is a pretty solid athlete by any standard. Webb ran the 40-yard dash in 4.79 seconds at the NFL combine last year and had a vertical jump of 33 inches despite being a long 6-foot-5. But it’s Manning's core that has caught the attention of his athletic fellow quarterback. "His core stuff is very strong. That is one thing I respect a lot about him," Webb said. "It's really tough to get even with him because his core is very, very strong." Even though Manning has struggled on the field the past few years, it doesn't appear to be his body that is letting him down. He's still in quality shape, even if there are days at training camp when his ball flutters. His arm remains relatively strong. Eli Manning, 37, is three years older than the next oldest Giant, which means it's imperative he stays in shape. A good diet is an important part of that, and Eli stays true to a healthy breakfast. His father, Archie, himself a former NFL quarterback, said earlier this summer that he believes Eli is throwing the ball better at 37 than he did at 27. Ten years ago, Eli was coming off his first Super Bowl victory. This is also one of the reasons new Giants general manager Dave Gettleman recommitted to Manning after a tumultuous 2017, when he was benched while Geno Smith started a late-season game in Oakland. It ended Manning's streak of 210 consecutive games started. With a heavier concentration than ever on his eating, nutrition, core and arm strength, Manning enters 2018 as strong as ever. "Yeah, arm feels great," he said early in his 15th training camp with the Giants. "You know, I don't think there's ever major changes that you do during the offseason. I think over the years there have been little tweaks, and you kind of get to where you are now, but nothing drastic in that sense. "But I feel healthy, feel strong and feel as good as I have felt going into any camp." Reaping the benefits of being the fittest 37-year-old his coach has ever seen.